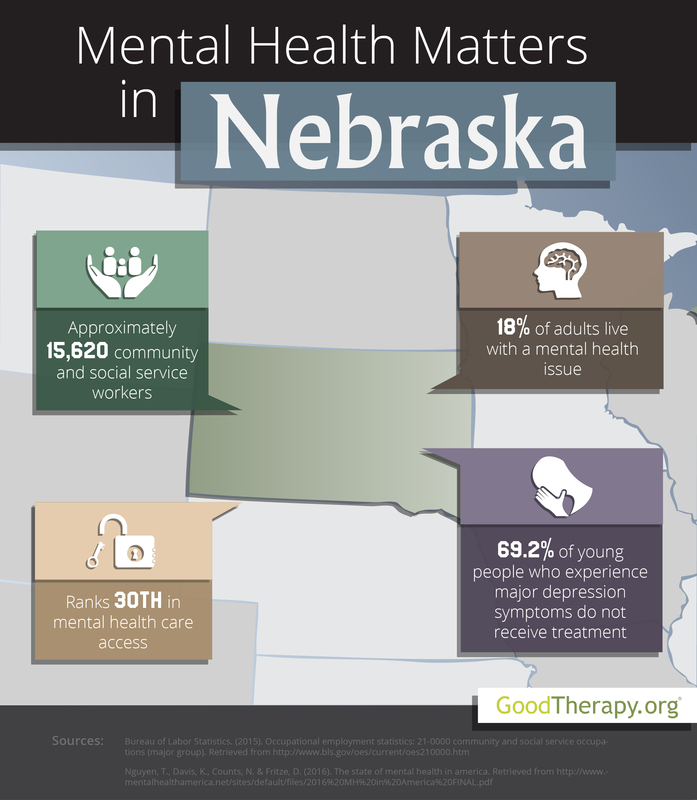 Find a therapist in Nebraska with GoodTherapy.org. The U.S. Census Bureau reports that Nebraska had a population of 1.9 million people in 2015. Approximately 89.4% of the population is white, 4.9% is black, 2.2% is Asian, and 1.4% is American Indian and Alaskan Native. Roughly 50.2% of all residents are female. Data from the United States Census Bureau (BLS) shows that in 2015, about 15,620 residents worked in community welfare and social service occupations in Nebraska. Therapists, school and university guidance counselors, community health workers, and social workers all fall within that major occupational group. According to the BLS, Nebraska residents who worked in this field earned an average of $38,470 annually. In Mental Health America’s (MHA) 2016 survey, Nebraska was ranked 20th for mental health conditions, resources, and practices. In the same survey, Nebraska was 30th in adult ranking, 22nd in youth ranking, 24th in prevalence of adverse mental conditions, and 30th in access to mental health treatment. With 18% of residents affected, Nebraska was ranked 13th for adult residents with mental health issues. The state was 33rd for adults with serious thoughts of suicide—an issue experienced by approximately 4.1% of adults in Nebraska. Therapists and analysts from Mental Health America have also pointed out the low prevalence of major depression among younger residents. According to the 2016 survey, 8.8% of young people in Nebraska experienced at least one episode of major depression in the previous 12 months and 4.4% are currently affected by severe depression symptoms. The state was ranked 8th and 3rd in these respective measures. Therapists in Nebraska as well as researchers from the Substance Abuse and Mental Health Services Administration (SAMHSA) and Mental Health America have identified substance dependence as a serious concern among residents of all age groups. A 2014 report from SAMHSA states the percentage of adolescents in Nebraska who perceive no great harm from smoking marijuana once per month increased from 63.7% in 2009 to 73.7% in 2013. The 2016 MHA survey gave Nebraska a ranking of 43rd for young people with drug or alcohol addictions—with 6.5% of adolescents affected—and a ranking of 42nd for adults with similar dependence issues, with 9.7% of all people in the state affected. Residents with addictive behaviors to chemical substances are urged to find a therapist or visit a drug and alcohol rehabilitation center in Nebraska. Consistent professional care has helped many people overcome these issues and lead richer lives. However, the 2016 MHA survey states 18.2% of adult residents with mental health issues are uninsured, and 9.4% of children in the state have private insurance that does not cover mental or emotional issues.